HARRISBURG, N.C., Aug. 14, 2014 – Wood Brothers Racing announces today that it has formed a technical alliance with Team Penske and will race a partial-season schedule in the 2015 NASCAR Sprint Cup Series with up-and-coming driver Ryan Blaney. Blaney, who has raced as a Team Penske development driver since 2012, will compete in at least 12 races for Wood Brothers Racing next season in the iconic No. 21 Motorcraft/Quick Lane Ford Fusion as he continues his rapid NASCAR development. Blaney will also practice and qualify the No. 21 this weekend at the Pure Michigan 400 at Michigan International Speedway while current Wood Brothers driver Trevor Bayne competes in the Nationwide Children’s Hospital 200 at Mid-Ohio Sports Car Course. Bayne will return in time to start the Sprint Cup race at the back of the field. Blaney is scheduled to make his official debut for Wood Brothers Racing in the 2015 Daytona 500. He will race for the team in events at Daytona, Las Vegas, Texas, Talladega, Charlotte, Michigan and Indianapolis, among others. He joins an impressive list of drivers who have driven for the Wood Brothers since 1950, including team founder Glen Wood, Curtis Turner, Junior Johnson, Dan Gurney, A.J. Foyt, Cale Yarborough, David Pearson, Neil Bonnett, Buddy Baker, Bill Elliott and Bayne who won the Daytona 500 with the Wood Brothers in 2011. That victory gave the team the unmatched distinction of scoring at least one win in every decade for the last seven decades. In addition to driving the Motorcraft/Quick Lane Ford Fusion for the Wood Brothers, Blaney will drive a Team Penske Mustang in the 2015 Nationwide Series. Blaney, son of Sprint Cup driver Dave Blaney, started his racing career in quarter midgets and won his first race at the age of 9. He has competed in and been successful in Bandolero cars, Legend cars, late model stock cars and the ARCA Racing Series before debuting in NASCAR’s K&N Pro Series West. In 2012, Blaney drove six races (recording two top 10s) in the Nationwide series before finishing the year with Team Penske, recording five top-10 finishes (including 2nd at Texas Motor Speedway) in seven Nationwide starts. Also in September of that year, he won his first Camping World Truck Series race at Iowa Speedway and was the youngest winner in the series at the time at 18 years, 8 months and 15 days. 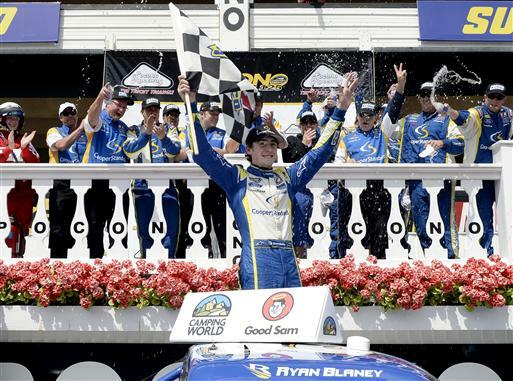 Blaney won his first Nationwide Series race last season at Kentucky Speedway leading 96 of 200 laps.